Experience the exceptional beauty of Khao Sok National Park and meet its many colorful inhabitants on this action packed four day three night adventure and jungle safari. Package includes all activities, accommodation and meals; does not include national park entrance fees and beverages. Our resort staff will welcome you on check in. Prepare for an afternoon of canoeing or tubing in the Sok River with a hearty lunch. River activities depend on seasonal water levels. End your first day with dinner and a nighttime safari before retiring to your tree house. Start your day with breakfast before traveling to Chiew Larn Lake. After you reach the destination, you’ll kayak around the lake for a few hours before lunch. 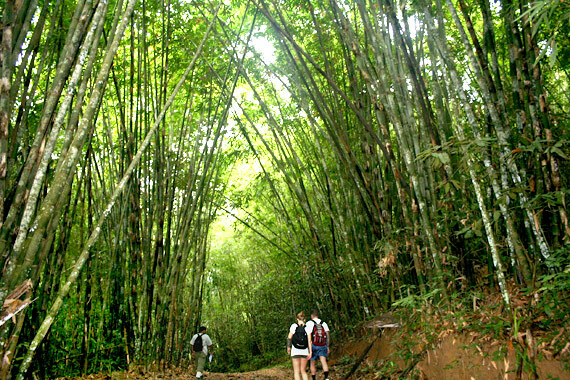 Spend the afternoon trekking through the jungle and exploring the Nam Ta Loo Cave or the Diamond Cave. Then, you’ll be taken back to the resort in time for dinner and another night in your tree house. After breakfast be ready to embark on your elephant experience. This up close and personal experience allows guests to get connect with this friendly giant at a dedicated elephant sanctuary. Unlike the cruel elephant rides many tourists come to experience, these majestic creatures enjoy a dignified life. You will have the opportunity to hand feed these gentle giants then spend a unique moment washing and bathing these giant elephants at a waterfall. After breakfast, our Resort staff can assist you with your onward journey.